Delancey and TfL have been working together to integrate the Northern Line tube exit with the redevelopment of the shopping centre site, plans due to be unveiled later this year, we've lined up Delancey to attend our TRA meeting in September. This project is why TfL announced that the centre of the roundabout will be a construction compound until the mid 2020s (not the new Square they've been marketing for a couple of years). It's also why I was eager for TfL and Delancey to integrate the new station into retaining the two busiest subways (New Kent Rd, Elephant link road) which would both satisfy the quick passage and give the subways a massive enhancement in quality and care. Delancey and TfL both agreed in meetings that the tube ticket concourse would almost certainly be below ground level like at Oxford Circus, Piccadilly Circus, Southwark, London Bridge etc and most zone 1 central London tube stations, because this would get foot traffic into the basement of the new enclosed shopping centre rather than bypassing it, which is good for retailers down there. I'm sceptical that Delancey would delay redevelopment of the site to allow their land to be used as a construction compound for the longer period required for tunnelling rather than just integrating the stations for which there's already budget and a timing plan assigned. Why not just double the bus services down the two proposed routes, to connect with the tube at Elephant? Or put in two surface tram lines? Surely quicker and cheaper than a tube extension, that will only go down one route? Buses and trams are not the answer here. Never were. These days it's the tube map is all that matters to young Londoners looking for their first home and their daily commute. Boris's sworn objective is putting SE London on the tube map and not in the horse and cart almanac. The whole point of underground travel, is to reduce congestion and get passengers from A to B faster. If, in a hypothetical scenario, the entire underground network (used by 1.265 billion passengers annually) was shut down and replaced with buses and tram lines, movement across our capital would grind to a halt. I see no reason why underground travel in SE London should perpetuate over a century of neglect. "The devil's in the detail with the Thameslink line and Camberwell, though. So, for the residents of Camberwell, it is far from certain that Thameslink will be the solution to their transport problems." This is interesting now more than one year on from your original post a quick glance at the Tfl consultation background report of September 2014 (section 4.1.4) details support for a station at Camberwell. If it's to be believed even as I type Southwark are engaged in negotiations to achieve precisely this objective. Maybe in the race for Bakerloo connectivity it now appears Camberwell are prepared to accept the wooden spoon of a reinvented rail connection. A Thameslink station. The tube comes to Camberwell only different. I do see what you're saying, but your argument sounds a bit estate agent-ish. Why not take cars off the road by some radical enforcement and use that space for trams or buses? James Barber is keeping his finger on the Bakerloo pulse as he finaly admits the one route option - entirely discarding Peckham - is now the only route likely to happen any day soon. 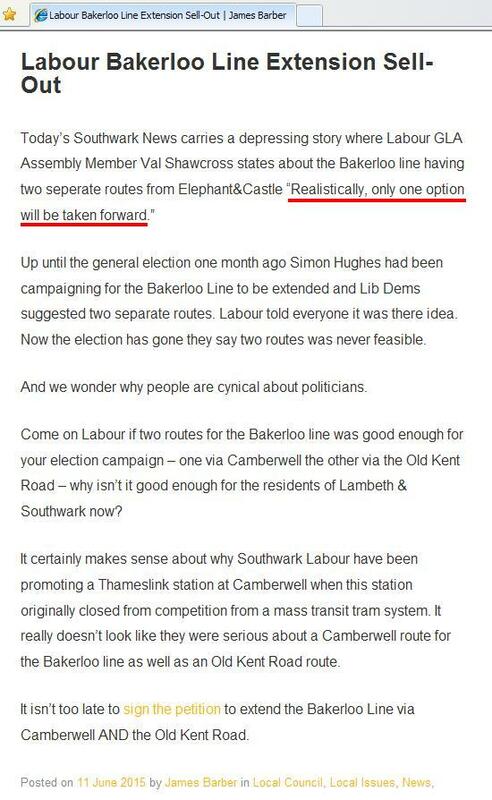 If Val is right about this not forgetting this is only politics the Old Kent Road is now seen as the one route and only option favoured by folks at City Hall. So Peckham is now front runner but sadly only for the TfL Wooden Spoon. Noteworthy to read in the same article Barber sees the original Thameslink station option for Camberwell as the way to go. As always - you read it here first. Ivanhoe - Yes estate agentish is about right. Property values and money are the drivers here not green thinking, cycleways and the air we breathe. Having said all that one tube train takes about two zillion cars off the road. So I'm told. So now we know for certain that the Labour proposal to run to Camberwell was an electoral sham all along. At least Labour covertly understood that Camberwell was a no-hoper - even if they were nefariously dishonest in how they promoted this ridiculous two-route idea. The twin-route option is totally unworkable operationally - just look at the tube map - there is NO tube line which does this. A line which bifurcates and then merges again can never deliver sufficient train frequency - you will always get hold ups at each point where it branches and merges again. The Northern line is, in effect, two separate, segregated lines: High Barnet to Kennington and Edgware / Mill Hill East to Morden. So the Lib-Dems have got it wrong also and just don't understand how you run a railway. It's so depressing to see them promote this twin-route, blissfully unaware that it could never actually function. And all these politicians are making decisions - God help us. Without democracy getting in the way you get absolutely superb public transport systems - just look at Moscow. Labour does not run the TFL, so it is understandable that they can see their election promises rejected by that body. Now, if at the next London Assembly elections Labour does well, thing might be different, particularly if they partner up with the other opposition parties, such as the Lib Dems. Land is land is land is land just as Boris is Boris and like money always needs to find a home. Doesn't much matter if that home is painted blue, red, yellow or even pink. The color of money is green.